Boeing Co. and European arch rival Airbus racked up billions of dollars worth of aircraft sales at the Farnborough International Airshow on Monday, raising hopes that the aviation industry has touched the bottom of a deep two-year downturn. But the horizon remains clouded - major European airlines, which are still haunted by recession, mostly kept their hands in their pockets as Middle Eastern carriers and U.S. plane leasing firms made purchases to build up their fleets. The optimism also isn't extending to the defense side of the sector where massive cuts to Western military budgets were the talk of the industry's premier event. The biennial gathering at an airfield outside London - bringing together plane makers, airlines, government officials and military top brass - is considered by industry watchers a key test of the industry's health. "We're gradually starting to see a slow recovery to a new norm," Owen MacFarlane, CEO of CAV Aerospace, told the AP from his exhibition stand at the show. "So maybe it's not the same volumes as we saw in 2007 and 2008, but certainly an increase from where we have been," he said, noting he cut 25 percent of his work force over the past 18 months. "Everybody seems a lot more buoyant." Analysts don't expect anything close to the record-breaking $88.7 billion worth of deals announced in Farnborough in 2008, but the gathering has already exceeded the slow orders for commercial planes at Le Bourget last year, where deals came in at around $7 billion. The International Air Transport Association has forecast that global industry profits will reach $2.5 billion this year, an upturn from the huge $9.4 billion loss in 2009. Asia and North America are expected to lead the recovery, with Europe lagging behind. Strikes at some airlines, the debt crisis and the volcanic ash cloud that caused major disruptions this spring are all hurting Europe's recovery. "There is a renewed enthusiasm to look forward again among the airlines," said Howard Wheeldon, a senior strategist at BGC Partners, who upped his forecast for commercial plane orders at the show to 400 from 300 after the early burst of announcements on Monday morning. Boeing Commercial Airplanes President Jim Albaugh said the market "has come back faster than we expected" and the Chicago-based company has twice raised its internal forecasts for the number of orders at the biennial show. The early orders, worth a total of $17.7 billion, included an Emirates deal to buy 12 Boeing 777-300ER jetliners, worth $3.6 billion at list prices. 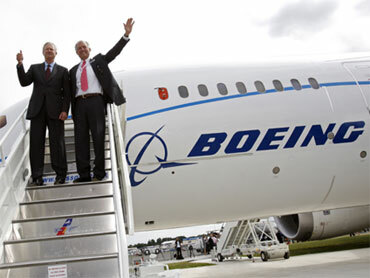 Boeing also received a $3 billion order from GE Capital Aviation Services for 40 737-800s. EADS-owned Airbus picked up a $4.4 billion order from Air Lease Corp. for 20 A321 aircraft and 31 A320s, a $4.9 billion order from GECAS, General Electric's commercial aircraft leasing arm, for 60 A320s. Russian flag carrier, Aeroflot, the only European airline to buy on Monday, ordered 11 of Airbus' A330-300 aircraft, worth $1.7 billion. Canada's Bombardier, a rising challenger to established giants like Airbus and Boeing, received an order for three business jets from Qatar Airways in a deal worth $122 million. Bombardier Commercial Aircraft President Gary Scott was cautious about the near-term outlook, saying that airlines needed to be sure they could sustain recent post-crisis gains before they had they "balance sheet and the courage to order airplanes in significant quantities again." "2011/12 is when the rising tide will lift all ships," he said. Wheeldon said that defense "worries are more significant than at any of the other shows I've attended." "Cuts are the order of the day, rightly or wrongly, as Western governments seek to pull back on their expenditure," he said. Giulio La Scala, Business Development Manager at Northrop Grumman Italia S.p.A, said several programs were suffering. "We are living in a period in crisis," La Scala said as he manned the company's display stand at Farnborough. "So many of the major products have been delayed or there has been a restriction on the number of aircraft that they are flying." Airbus expects to start delivering A400Ms sometime after December 2012 , around four years behind schedule and 50 percent over budget because of technical glitches. The original seven customer nations for the aircraft - Belgium, Britain, France, Germany, Luxembourg, Spain and Turkey - agreed with Airbus' parent European Aeronautic Defense & Space Co. in March to spend an additional euro3.5 billion to save the project after months of bickering about who should pay for cost overruns. Analysts will also be watching for developments in the bitter Boeing-Airbus battle to win a $35 billion contest to provide aerial tankers to the U.S. Air Force - the World Trade Organization ruled earlier this month that European governments gave Airbus illegal subsidies for the project. The show runs July 19-25 at an airfield about 30 miles west of central London.